St Margaret is that rare thing among the Saints; it is a proper village. It is also the biggest of the South Elmhams, stretching for half a mile or so along the curving road between Homersfield and Halesworth. For much of the way, council houses add a touch of life to the place, several of them with roadside stalls selling eggs, flowers and apples. I liked this a lot. The church is in the tightest part of the curve, with a hemmed in graveyard full of close packed 18th and 19th century graves. The best of these is in the south wall, for Dan and Buck, who died in the 1720s. It reads, in part: In Fine, All must to their cold Graves. But the Religious Actions of these two Just Do smell sweet in Death and blossom in the dust. The 14th century tower has pretty little windows in its stair turret, but the outside was generally sanitised by our old friend Phipson in the 1870s. In the porch, you'll find the village stocks; it takes a moment or two to work out what is strange about them, and then it hits you. There is an odd number of holes. Possibly, centuries of inbreeding had resulted in an 18th century race of felons with three legs. Or possibly not. Shaking off this disturbing vision (which, nevertheless, should remind us not to take historical evidence at face value) and stepping through the Norman south doorway, you enter this lovely little church. The roof is simple yet beautiful, accentuated by the high tower arch, and the lovely glass in the west window. It is probably by FC Eden, who was very busy indeed a few miles off at Barsham. Of all the Saints, St Margaret appears to have been the one which was most High Church in the 19th Century. Geenrally, Anglo-catholicism reached East Anglia late, most places not becoming enthusiastic about it until well into the 20th Century, but there were a couple of early hotspots, one of which was Barsham and Shipmeadow, the homes of the Sucklings, who were recruited to the cause as early as the 1860s. This also seems to have been an uncharacteristically wealthy parish, and as well as the Eden glass there is good glass here by the Ward & Hughes and Clayton & Bell workshops.Generally, everything is finished to the highest quality here. A striking feature of the chancel is the early 16th Century Easter Sepulchre; it is a late one, crisply carved, but if it was also a tombchest then we no longer know who it belonged to. It is small, compact, like its church. A rare survival, and one easily missed, is the section of the rood screen dado in the corner of the sanctuary. The figures are barely discernible, but Mortlock thought that one of them was probably St Hubert, a unique survival in East Anglia. A curiosity is the graffiti in the cement above the tower doorway. Graffiti is fairly common in East Anglian churches, especially from the 17th century when the local puritans seem to have taken to producing it with their sleeves rolled up as a positive duty, but this is earlier and more elaborate than most. On the right hand side is the name John Sellynge in an Elizabethan script, and to the left is an elaborate rose, which may have been a consecration cross, but which was probably intended as nothing more than a beautiful mathematical design. It must have taken hours. This is a small church, richly furnished and pleasing to the eye. 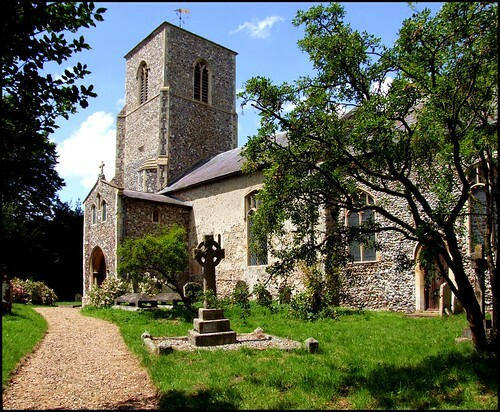 I think that St Margaret is the most interesting and beautiful of all the churches in the Saints, and it is entirely to its credit that it is open to visitors every day.